A range of activities to download and print. Includes Halloween projects, activities and recipes. Includes Halloween crafts, printable worksheets to complete and recipes. 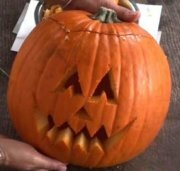 Provides a video demonstration of the steps involved in using a knife, fork and spoon to make a halloween pumpkin (though the video omits the step of spooning out the guts of the pumpkin). SAFETY WARNING: Best to involve a responsible adult in handling the knife and the fork. Paper plate craft, cupcake picks, Tattle Monster, black cat, googly eyes. A huge range of crafts to choose from, from bucket of eyeballs to Halloween masks to hanging bat mobiles. Suggested art activities for the very young. This Enchanted Learning collection contains many paper and scissors activities. Click on "Download activity sheet" for a pdf file containing parts of a skeleton to cut out and join together. Banners to save, print and join. Pinterest collection of Sparklebox Halloween printable templates, banners, colouring sheets and other teaching aids to print out. A nine-question multiple choice Halloween trivia quiz. Choose up to 11 questions from five difficulty levels. 41 pictures to choose from! Colour online or print out. Seven ghosts and a haunted house to colour in. Labelled sheets to colour in: bat, ghost, pumpkin, spider, wand, cauldron. Succinct, highly active explanation (2m15s) of the origin of Halloween and its features. Succinct, highly active explanation (2m33s) of the origin of witches. Scroll down for the police-produced video (2m30s) on having a safe Halloween.